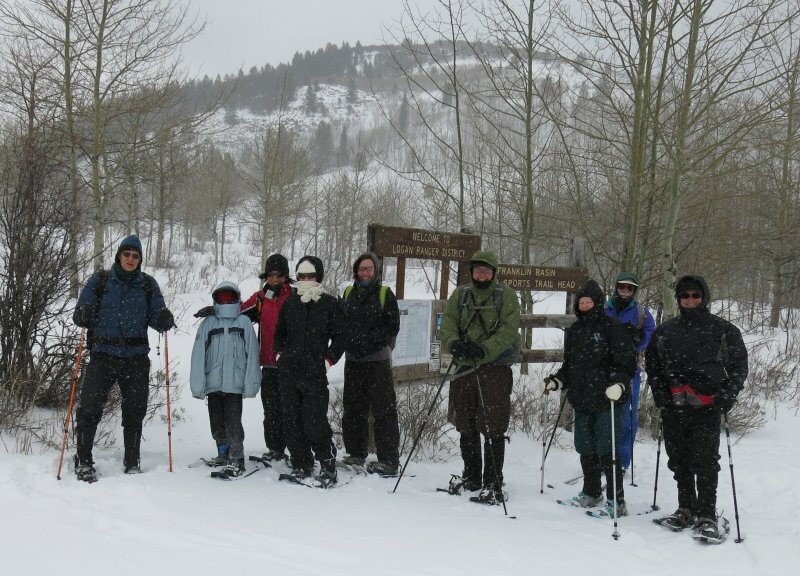 Ten Cache Hikers participated in a snowy St. Patrick's day trip in Franklin Basin. 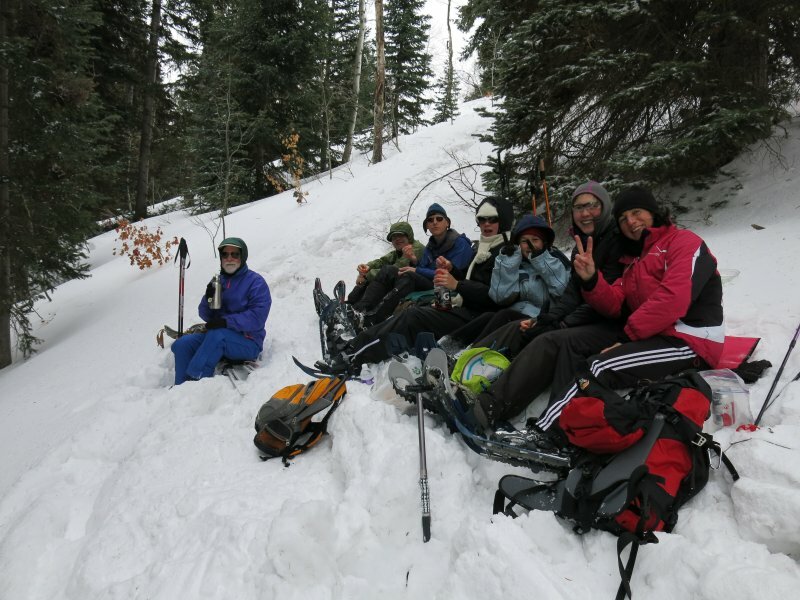 The skiers were Dave P. and Dave W., while Alexi, Jim, Christine, Tim, Jeanne, Michael, Meghan and Dan (the trip leader) were on snowshoes. We left Smith's Marketplace in Logan shortly after 10:00, just as a light rain started. 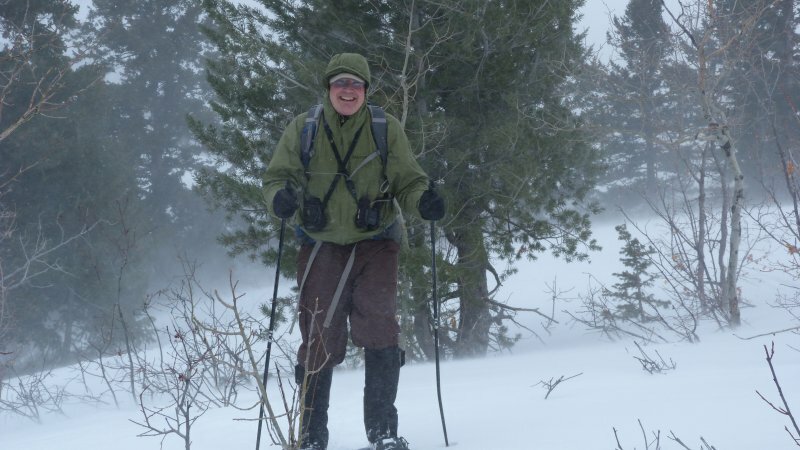 The weather worsened as we drove up Logan Canyon, and it was snowing and blowing and the road was snow-covered and slick by the time we got to Franklin Basin. We started out from the Franklin Basin Winter Trailhead at 11:00, and hurried across a meadow to calmer conditions along the Steam Mill Trail. After about 1.25 miles on the Steam Mill Trail, Jeanne and Tim headed back so they could attend an event at Beaver Mountain. The rest of the group turned toward the north and climbed to a ridge top. The blowing snow here encouraged us move to a sheltered location nearby for lunch (Dave W. shared green cookies to celebrate St. Patrick's Day). About 1:00 we resumed the trip by traveling along the contour for another 1/2 mile. Here, five people started down, but Dan, Alexi and Jim decided to continue up to a viewpoint on the ridge - see the location marked "Dan's viewpoint" on the map, below. Eventually the two groups reassembled, and we all headed downhill to the Franklin Basin road and finally, back to the trailhead at 2:30. The snow was good for the skiers, with 6 inches of new powder on top of an icy crust. The snowshoers had more trouble, however, as they frequently broke through the crust. The trip totaled 2.5 miles with 450 feet elevation for Jeanne and Tim. Dave W., Dave P., Christine, Meghan and Michael traveled 3.7 miles with 650 feet of climbing, and Jim, Dan and Alexi went nearly 3.9 miles with 750 feet of elevation gain. Thanks to Christine and Dan for photos. Jim and Alexi on the windy ridge at "Dan's Viewpoint"